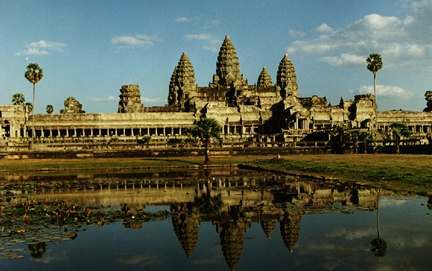 This is Angkor Wat, the worlds largest temple. It is an entire square kilometer in size. 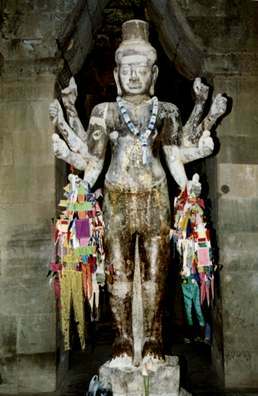 This temple was built in the 12th century and is the best preserved of all the Angkor ruins. 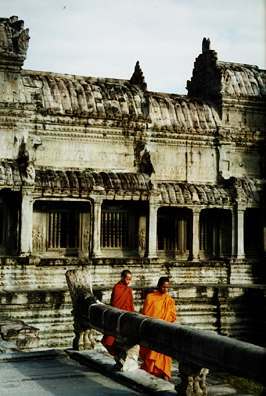 Angkor is still a place of worship and there is a large resident population of Buddhist monks. 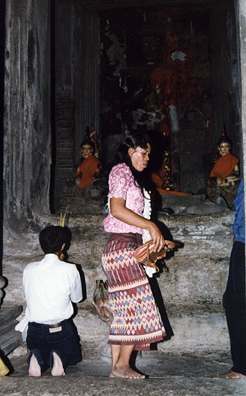 Many Cambodians come to pray and make offerings at the few statues left in Angkor. Most have been looted or broken by thieves, the French, or the Khmer Rouge. 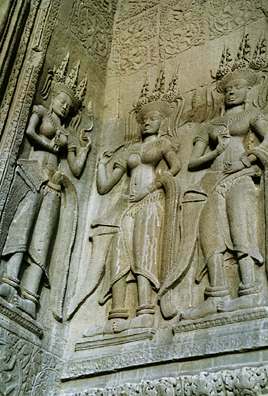 Angkor is a mixture of both Buddhist and Hindu art forms. I believe this statue represents the Hindu god Shiva. 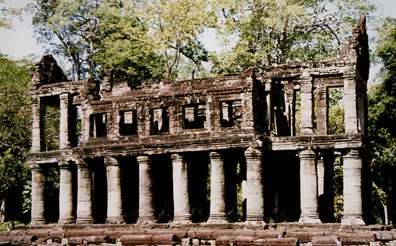 This structure at the Preah Khan temple complex is the only two story building at Angkor. It is thought to have been either a library or where a sacred sword was stored. While French archeologists restored most of Angkors monuments by removing the vegetation and putting the stonework back together, they did leave the temple of Ta Prohm mostly as they found it. 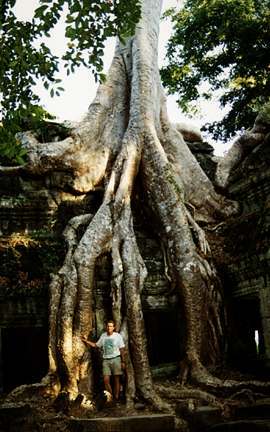 This photo shows how giant fig trees grew over the ruins. 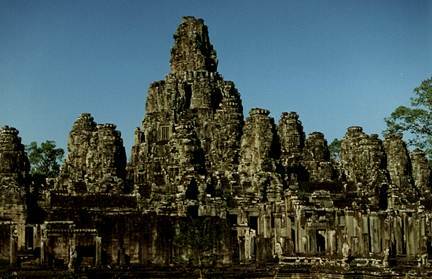 This is The Bayon temple. It is famous for the 144 huge stone faces that stare at you from every direction. 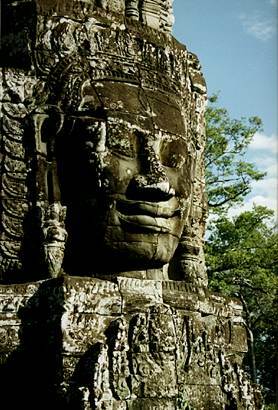 The faces are thought to be of Jayavarman VII, one of the powerful rulers of Angkor in the 12th century. This is a clasp of one of the Bayon faces. At first glance the faces all seem the same, but there are many subtle differences. It is thought that when the temple was in use the faces were covered in plaster and painted in lifelike colors. 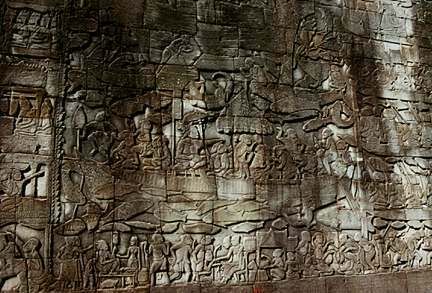 This is one of the bas-reliefs around the base of the Bayon. It shows the Hindu creation myth called "the churning of the sea of milk." You can see many animals depicted as they were "created." These are depictions of celestial dancers called Asparas. 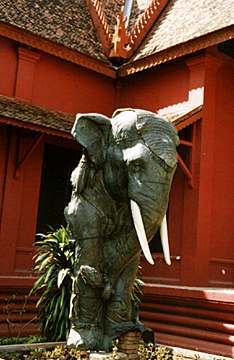 This portion of a bronze elephant was found in one of the ponds at Angkor. It is now outside the National Museum in Phnom Penh. Many of Angkors treasures have had to be moved there to protect them.